A group of medical students lay down outside the Manhattan headquarters of News Corp. Monday afternoon to protest Republican efforts to repeal the Affordable Care Act. Many were dressed in their white lab coats as they chanted "Not tomorrow, not today, don't repeal the ACA." The goal, organizers said, was to draw attention to those who might lose their lives without access to health care. 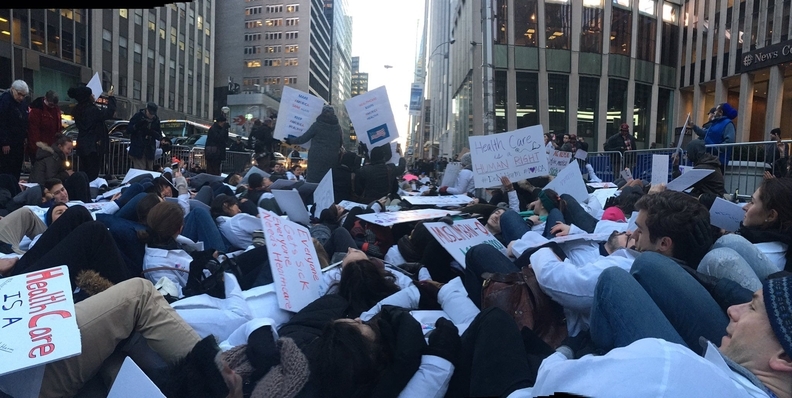 The "die-in" and rally were part of a national day of action by students, faculty and administrators at 21 medical schools across the country, including several in New York City. The actions were united by the use of #DoNoHarm, #ProtectOurPatients and #SavetheACA. The Icahn School of Medicine at Mount Sinai in East Harlem canceled classes Monday for first- and second-year students so they could phone politicians, attend a discussion on social justice in health care and make signs for the rally that afternoon. Many third- and fourth-year students joined them. "I think the medical school community as a whole, when compared with other generations of doctors, is pretty united when it comes to denouncing the repeal of the Affordable Care Act," said Kamini Doobay, a fourth-year student at Mount Sinai, who helped organize the day's events. Doobay, a member of the NYC Coalition to Dismantle Racism in the Health System, said she and others at Mount Sinai helped spread the word about the event locally over the past few weeks, while the national group Protect Our Patients helped the event gain traction across the U.S. She said future events organized to resist President Donald Trump's platform will follow. "I feel I can speak for all of us in medical education in saying that we are not worthy, watching you guys in action," said Dr. David Muller, dean for medical education at the Icahn School of Medicine, speaking before an audience of students and faculty Monday afternoon. Anirudh Kumar, a third-year medical student, spoke to Crain's in the student lounge at Icahn after calling Rep. Carolyn Maloney (D-N.Y.) to voice his concerns. He said he spoke to her office about a number of issues, including the nominations of Betsy DeVos and Sen. Jeff Sessions (R-Ala.), but said the ACA's repeal was his biggest concern. "I certainly think, for all of us, the ACA is near and dear to our hearts because we see patients every day, and we know what it feels like to struggle to get care and have access to it," said Kumar, who is doing a clinical rotation in neurology. "It's something we can relate to and speak about in a more informed capacity, so that's why everyone is here." Kumar, originally from California, said he was in New York City during the heyday of Occupy Wall Street but is more motivated to get involved politically in the wake of President Donald Trump's victory. "Certainly what's happening right now is prompting me to do more than I usually do." While not all New York City medical schools had lighter schedules, several organized their own demonstrations of resistance against Trump's platform. Students at the Albert Einstein College of Medicine marched from their campus in the Bronx to Jacobi Medical Center around 11 a.m. Meanwhile, the Columbia University College of Physicians and Surgeons scheduled a late-afternoon "teach-in," during which leaders of student-run clinics and affinity groups spoke about how the repeal of the ACA would be detrimental to the groups they serve. They then wrote down future actions they could take to help protect the ACA on note cards. According to an organizer at Columbia, the note cards will be placed in a prominent place on campus and arranged to spell out a message: "Do no harm."—C.L. "NYC med students stage 'die-in' protesting Obamacare repeal" originally appeared in Crain's New York Business.